Fresh View is a another awesome template from MS Design BD. 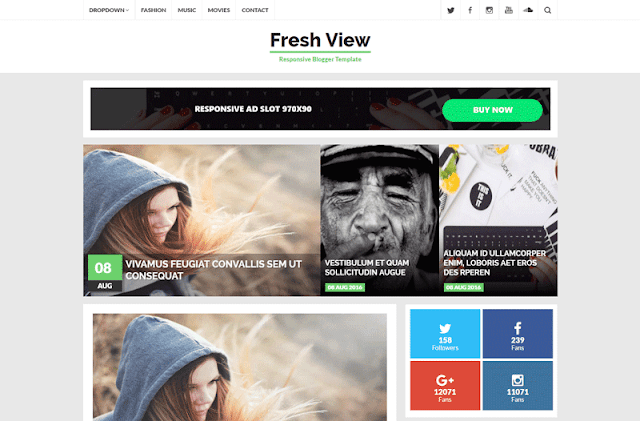 Fresh View is fully responsive and SEO optimized blogger template. You can use this template on your personal blog site. Fresh View Blogger template is perfect for any review or blog site. In this template we first time use a awesome social icons with hover effect widget like, Facebook, Twitter, Pinterest, Instagram, Google Plus, Linkedin, Flickr and Vine Social icons that will like anybody. This is best minimalist and professional blogger template for blogspot platform. Fresh View, its simple but awesome for any kind of personal blog. In this template we again use recent post Carousel with professional look. Now see some awesome features of Fresh View Blogger Template.